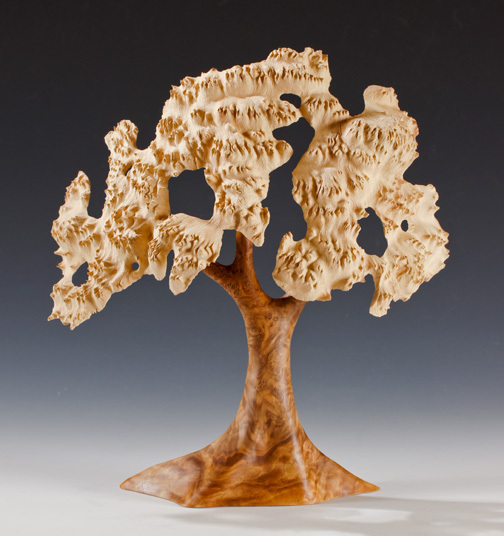 These trees are made from burls that grow on the Mallee tree, a hardy desert species that grows very slowly in arid inland regions of Australia. The burl is removed, but the tree grows bark over the scar and lives on unharmed. The wood is among the heaviest and hardest in the world, so the initial carving is done when the wood is freshly cut and still green. Then it is left for one year to dry before finishing the carving and sanding. 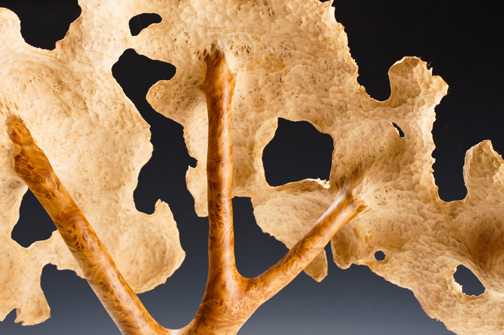 Each tree is made from one piece of wood. The white "foliage" is the sapwood that grows just under the bark, while the trunk and branches are part of the dense, dark heartwood (see detail photo).